Does mild COPD affect prognosis in the elderly? Chronic obstructive pulmonary disease (COPD) affects independence and survival in the general population, but it is unknown to which extent this conclusion applies to elderly people with mild disease. The aim of this study was to verify whether mild COPD, defined according to different classification systems (ATS/ERS, BTS, GOLD) impacts independence and survival in elderly (aged 65 to 74 years) or very elderly (aged 75 years or older) patients. We used data coming from the Respiratory Health in the Elderly (Salute Respiratoria nell'Anziano, SaRA) study and compared the differences between the classification systems with regards to personal capabilities and 5-years survival, focusing on the mild stage of COPD. We analyzed data from 1,159 patients (49% women) with a mean age of 73.2 years (SD: 6.1). One third of participants were 75 years or older. Mild COPD, whichever was its definition, was not associated with worse personal capabilities or increased mortality after adjustment for potential confounders in both age groups. Mild COPD may not affect survival or personal independence of patients over 65 years of age if the reference group consists of patients with a comparable burden of non respiratory diseases. Comorbidity and age itself likely are main determinants of both outcomes. Chronic obstructive lung disease has as key feature the reduction of forced expiratory volume in 1 second (FEV1) relative to the vital capacity (VC) or to the forced vital capacity (FVC), and various cut-off of the FEV1/FVC ratio have been proposed to diagnose this disease. According to the British Thoracic Society and the UK National Institute for Clinical Excellence (NICE) a diagnosis of COPD requires both FEV1/FVC < 0.7 and FEV1 < 80% predicted , while the Global initiative for Obstructive Lung Disease (GOLD) guidelines proposes a FEV1/FVC <0.7 as diagnostic standard, classifying as GOLD class II those also having a FEV1 < 80% predicted. The 2004 European Respiratory Society (ERS)/American Thoracic Society (ATS) guidelines also use a fixed cut-off of 0.7 for the FEV1/VC ratio , but a statement on interpretation of spirometry issued in 2005 strongly suggests to use the lower limit of normal (LLN) to make a diagnosis of bronchial obstruction . In the same guidelines, severity classification is based on FEV1% predicted, with a cut-off for the first (mild) class set at 70%. Further classification issues arise in elderly patients: in this population the use of the 0.7 fixed cut-off to diagnose bronchial obstruction has been criticized because it overestimates disease prevalence compared to the LLN , and a lower cut-off (0.65) has been proposed . Data from the Cardiovascular Health Study, however, show that elderly people with FEV1/FVC < 0.7 but > LLN have an increased risk of death compared to their counterpart with FEV1/FVC ≥ 0.7, lending support to the use of a fixed cut-off set at 0.7 in this population . Data on the prognostic significance of the different classification methods are scant, especially with respect to the "mild" category. The interest in the "mild" category comes also from the fact that two out of the three most commonly used guidelines include in this classification patients with a normal FEV1. Since the FEV1 is the physiologic parameter of interest in COPD and it has been shown to have important prognostic implications , it is reasonable to question what is the prognosis of people classified as having mild obstruction according to the ATS/ERS or GOLD classification (i.e. with normal FEV1) compared to those classified as having mild obstruction according to the BTS classification (i.e. with reduced FEV1). On this basis, we analyzed data coming from a large collaborative study on respiratory health in elderly people (SaRA Study) to verify the association between mild COPD, defined according to different algorithms, and mortality and functional status in a sample of elderly (age 65 up to 75 years) and very elderly (age ≥ 75 years) patients. Between January 1996 and July 1999 a total of 1970 out-patients were recruited from 24 departments of geriatrics or respiratory medicine within the context of the SA.R.A. (Salute Respiratoria nell'Anziano - Respiratory Health in the Elderly) study. Details on the SA.R.A. project are available elsewhere . This is a multi-centre Italian project, investigating various aspects of chronic airway diseases in the elderly population (age ≥65 years) attending pulmonary or geriatric outpatient clinics. Researchers had an extensive training in both respiratory function study of the elderly and multidimensional geriatric assessment. Enrolment was on a consecutive basis up to the achievement of a target number of about 200 COPD and 200 asthmatic patients. The study also enrolled as a control group outpatients aged 65 years and over attending the geriatric clinics for non respiratory conditions, the most common of which were: hypertension (27.3%), arthritis (27%), diabetes mellitus (12.7%), coronary artery disease (11.4%), and cerebrovascular diseases (7%). Data from individual centres were collected by a coordinating centre at the Cattedra di Malattie dell'Apparato Respiratorio of the University of Palermo, which was also responsible for the quality control, the retrieval and the final processing of data. The study design was approved by the Ethical Committees of University of Palermo and of the participating institutions. Patients gave their written consent to participate in the study. All the centres were provided with an identical fully computerized water-sealed Stead-Wells spirometer (Baires System; Biomedin; Padua, Italy) matching the standards of the American Thoracic Society recommendations for diagnostic spirometry. Baseline and post-bronchodilator spirometry were performed according to the guidelines of the American Thoracic Society . All the centers achieved a high quality performance in spirometry. Spirometric flow-volume curves were considered acceptable if they had Extrapolated Volume (VEXT) <5% of the FVC or <0.150 L, a FET > 6 sec and a plateau of 1 second, or a FET > 10 sec. According to recommendations by ATS, we did not exclude curves which did not satisfy the repeatability criteria to avoid the exclusion of data in which an abnormal lung function causes a greater coefficient of variation than in normal subjects. Overall, 1,759 spirometries were available for the analysis. Reasons for not performing the exam included refusal, physical impairment, and inability to understand the instructions. We excluded participants with spirometries that did not meet acceptability criteria (N = 382). We also excluded participants with missing anthropometric values (N = 8). Vital status information as of January 30, 2002 was ascertained by contacting the registry office of the last municipality of residence, and the data was obtained for 1159/1369 participants (85%). Follow-up time was calculated from the date of recruitment (first visit) until the date of death, January 30, 2002, or at 60 months of follow-up, whichever came first. Participants could of course fall into more than one definition, and were counted into each. Thus, the study population consisted of patients meeting at least one of the three definitions of bronchial obstruction, while the control population included ambulatory patients without respiratory problems. Accordingly, we evaluated the prognostic significance of mild COPD against a control group representative of the general elderly population. We used descriptive statistics to report the demographic and clinical characteristics of the three groups of patients with mild COPD. Performance capacity was evaluated using the distance walked in 6 minutes (6MWD), expressed as % of predicted according to the equation proposed by Enright . Cognition and mood status were explored using the Mini-mental State Examination (MMSE) and the Geriatric Depres-sione Scale (GDS), respectively, while as a reference indicator of prognosis we used a validated score based on body mass index, severity of bronchial obstruction, dyspnea, and exercise capacity (BODE index) . We calculated mortality rated normalized to 100 person/year (100 PY) along with 95% confidence intervals (95% CI). For each definition, we calculated the mortality rate ratio using as control group participants who were non-obstructed according to the relevant classification. We also obtained an estimate of the hazard ratio for mortality adjusted for age, gender, smoking status and FVC using a Poisson model. We used this parametric approach instead of the more commonly used Cox model because preliminary analyses showed that the proportional hazard assumption was not tenable. In order to assess the impact of mild COPD on health status, we compared the 6MWD, Barthel index, MMSE, and GDS of control subjects and COPD patients alternatively grouped according to each of the three classifications. We used ANOVA for data having normal distribution and homogenous variance, the Kruskal-Wallis test otherwise. All analyses were performed separately in participants aged <75 and ≥ 75 years using SAS 9.0 for Windows (SAS Inc, Cary NC) and Stata 10.0 for Windows (StataCorp, College Station TX). The final sample size was 1,159, women were 48.7%, the mean age was 73.2 (SD: 6.1), and 429 participants (37.1%) were 75 years or older. The overall prevalence of bronchial obstruction was 40.0%, 28.5%, and 43.6% according to the ATS/ERS, BTS and GOLD definitions, respectively. Table 1 shows the prevalence of bronchial obstruction according to the different definitions. Among participants aged 65 to 75 years, mild obstruction was present in 18.8%, 18.5%, and 10.8% using the ATS/ERS, BTS, and GOLD classification, respectively. The prevalence of mild obstruction among older participants was similar using the ATS/ERS and BTS classifications, while using the GOLD definition the figure was doubled (22.4%) compared to the one observed in the group aged 65-75 years. There were few differences in the prevalence of major diseases across COPD severity regardless of the classification systems; however in patients under 75 years the BTS-rated mild COPD was associated with a greater prevalence of ischemic heart disease with regard to non obstructed patients, while the opposite was true for the GOLD-rated mild COPD. Also indexes of personal capabilities, cognitive and affective status of controls and cases alternatively classified according to each of the three classifications showed no clinically significant differences between people without obstruction and with mild obstruction (tables 2 and 3). Clinical and functional characteristics, by age and severity of obstruction. In this group, the overall mortality was 2.5/100 person/year (95% CI: 1.98 - 3.08), with substantial difference between men (MR: 3.6/100 PY, 95% CI: 2.72 - 4.62) and women (MR: 1.4/100 PY, 95% CI: 0.94 - 1.14). The most common causes of death were tumors and cardio-vascular diseases; pulmonary diseases accounted for 6% of cases. 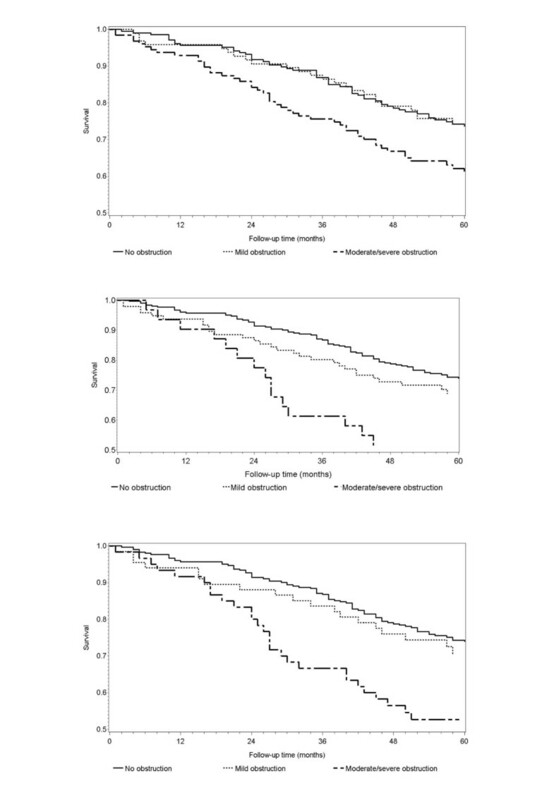 Moderate/severe obstruction was associated with an about four-fold mortality regardless of the classification system (table 4 and figure 1). 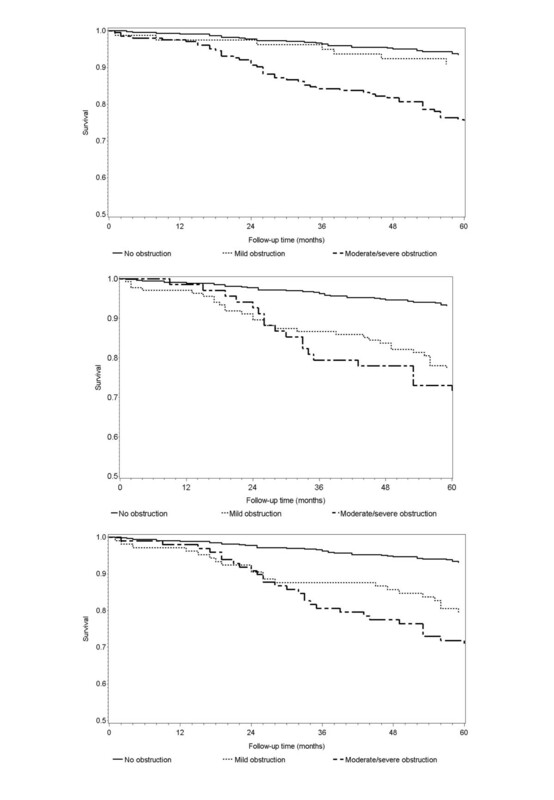 Mortality associated with mild obstruction, however, showed differences according to different definitions: mortality was increased (MRR: 3.62, 95% CI: 2.14 - 6.07) using the BTS and, less markedly (MRR 1.97; 95% CI: 1.01 - 3.70), the ATS classification, while we found no increase in mortality associated with mild obstruction defined according to the GOLD criteria (MRR: 1.42, 95% CI: 0.52 - 3.34). After adjustment for age, gender, smoking exposure and FVC, the MRR for mortality associated with BTS-rated mild obstruction was no more statistically significant, while those associated with more severe obstruction were reduced, but still statistically significant. Crude and adjusted mortality rate ratios (MRR) associated with severity of obstruction according to different classification systems, by age. 1Adjusted for age, gender, smoking exposure, and FVC. Survival by COPD severity in patients aged 65-74 years (unadjusted Kaplan-Meier curves). Upper panel: ATS/ERS classification; middle panel: BTS classification; lower panel: GOLD classification. Log-rank P < 0.001. As expected, the overall mortality of older participants was higher, 6.9/100 person/year (95% CI: 5.68 - 8.28). Once again, mortality was higher in men (MR: 8.7/100 PY, 95% CI: 6.95 - 10.88) compared to women (MR: 5.0/100 PY, 95% CI: 3.67 - 6.77). The most common cause of death were cardio-vascular diseases (31.7%) and tumors (25.2%); pulmonary diseases accounted for 13.0% of deaths. Only mild obstruction defined according to the BTS criteria was associated with increased mortality (table 4 and figure 2) in this group. More severe obstruction was associated with mortality, but the risk was increased less compared to patients aged 65-75 years; severe obstruction defined according to the BTS criteria was associated with the greatest increase in risk (MRR: 2.83, 95% CI: 1.43 - 5.60). After correction for potential confounders, only severe COPD as defined by the BTS criteria was still associated with mortality (MRR: 2.01; 95% CI: 1.07 - 3.98). Since in older patients mortality associated with COPD might be reduced because of competing risk, we evaluated whether another severity indicator (the BODE index) was associated with mortality in this age group and found an adjusted HR of 1.26 (95% CI: 1.14 - 1.41) for each one-point increase in the BODE score. Mortality by COPD severity in patients aged ≥ 75 years (unadjusted Kaplan-Meier curves). Upper panel: ATS/ERS classification; middle panel: BTS classification; lower panel: GOLD classification. Log-rank P = 0.003. Our results confirm that the estimated prevalence of COPD depends on the definition used, but "mild" COPD, regardless of the definition used, impacts neither prognosis nor personal capabilities in an elderly population. Clinical diagnosis of COPD should not rely on spirometry alone, but a positive spirometry is required by all guidelines to make a definitive diagnosis. For this reason, and also for practicality, most epidemiological studies use spirometry to identify people with COPD, making the issue of spirometric definition of bronchial obstruction an important one. As expected, the GOLD guidelines yielded the highest estimated prevalence of COPD and the BTS the lowest, a result that is also in line with other studies [11, 12]. Diagnostic algorithms using a fixed cut-off to identify bronchial obstruction are expected to provide higher prevalence estimates in the elderly compared to algorithms using the LLN; in our data, however, this was true for the GOLD but not for the BTS classification. The likely explanation for this finding is that the BTS classification system also requires a reduction of the FEV1%. On the other hand, it cannot be excluded that the prevalence of COPD in elderly people is actually higher, as shown by different authors [13, 14]. It should be noted, however, that most of these data have been obtained in studies defining COPD using a fixed cut-off, and no data are available on the age-specific prevalence of COPD defined using the LLN. The use of the LLN is only partial solution to these problems. The LLN is population-specific, and ideally should be calculated on a subset of healthy, non-smoking persons of the population under study, which is obviously hardly feasible in most studies and in the clinical setting. Using LLN derived from external studies is easier, but they can have a wide variability  and their use also carries a significant risk of misclassification [16, 17]. In participants aged 65-75 years, we have found that, after adjustment for potential confounders, mild COPD is not associated with increased mortality, but this finding should be interpreted also taking into account the relatively small sample size of our study. Mannino et al. have shown in a population aged up to 66 years that the adjusted hazard ratio for mortality in GOLD stage 1 COPD was 1.4 (95% CI: 1.1 - 1.6), which is close to the 1.2 we found in our sample . In another large screening study, among middle-aged men the hazard ratio for mortality associated with GOLD 1 ranged from 0.8 to 1.3, depending on smoking exposure . There are scant data on the risk of mortality in patients with mild COPD as defined by the ATS/ERS criteria; it has been shown, however, that people aged 65 years and older with FEV1/FVC <LLN and FEV1 ≤ 80% of predicted have an adjusted mortality rate ratio of 1.4 . Interestingly, in the group aged 75 years and older, we found no association between moderate/severe COPD (ATS/ERS and GOLD classification) and mortality. This finding likely reflects the preeminent prognostic role of non respiratory factors in older people, even with severely reduced FEV1. Among these factors are age itself, comorbidity and performance capacity . Indeed, we found that the BODE Index was associated with mortality in this age group, indicating that a multidimensional index is effective also for the very old. Further supporting the primary role of multidimensional assessment in contrast to the monodimensional FEV1-based assessment is the finding that people with respiratory symptoms, but without spirometric abnormalities, have a worse prognosis [18, 19]. Furthermore, symptomatic, but not asymptomatic, patients with GOLD stage 1 COPD have faster FEV1 decline, increased respiratory care utilization, and worse quality of live . Even in GOLD stages 2-3, symptoms seem to have important prognostic implication over and above spirometric abnormalities . Thus, the global burden of disease rather than bronchial obstruction seems relevant to predict prognosis of elderly COPD patients. At any rate, it should be noted that the relationship between FEV1 reduction and mortality is a complex one, as shown by recent randomized trials showing that improvement in FEV1 does not translate in increased survival [22, 23]. In this sample, personal capabilities, affective and cognitive status of mild COPD patients did not differ from those of control subjects with comparable non respiratory diseases, indicating that comorbidity, more than mild COPD, likely accounts for impaired health status. A study by Coultas et al. , however, have found impaired personal capabilities even in COPD subjects unaware of having the disease, which is consistent with an direct association between mild COPD and health status. Differences in mean age between ours (73.2 years) and Coultas' patients (65.7 years) might explain this discrepancy. Furthermore, our controls were not healthy subjects, but patients with non respiratory conditions. This likely enabled us to disclose the relationship between comorbidity and personal capabilities. Finally, physical performance measured by the 6MWD was not different between participants with mild COPD defined by the three alternative classifications, although those diagnosed according to the BTS criteria have a lower FEV1. This is confirmatory of previous studies showing that the FEV1 is not the best predictor of performance capacity in COPD [25, 26] and that patients with mild disease defined using the GOLD criteria have a performance similar to that of a control group free from pulmonary diseases . This study is limited by its relatively low power and by the fact that its 5 years follow-up time may be too short to detect important differences in mortality in people having mild COPD. It should be noted, however, that the mean age of our older participants -- which was the group of major interest -- was 80 years, and in a group with such an age five years should suffice to provide information on mortality. It should be also noted that the selection of patients from health care facilities might limit the representativeness of the sample. Furthermore, we had no generic index of health-related quality of life recorded in the whole population and we cannot exclude that mild COPD affects this outcome. On the other hand, the availability of a control group with comparable age and comorbidity improves the reliability of our estimates of the prognostic properties of mild COPD. Finally, a consistent proportion of participants could not perform an acceptable spirometry. This information is not new, and we have already reported  that elderly patients unable perform an acceptable spirometry have worse physical and cognitive performance, and lower education and therefore have an inherently poorer prognosis. In theory, obtaining acceptable spirometric information also in these patients (e.g. using the FEV6 instead of the FVC) might show a poorer prognosis even in those with mild obstruction. Our data indicate that mild COPD may not affect survival and personal capabilities of patients over 65 years, regardless of the criteria used to diagnose it. In this group of patients, comorbidity and age itself likely are the major determinants of these outcomes. CP and SS had the original idea for the paper. CP and FF planned the statistical analyses. CP, CS and RAI drafted the manuscript. All the authors revised the paper for important intellectual content.